When you first receive your Amazon Echo Dot, you will note that it basically looks like your Echo has been decapitated. That’s because it is, essentially, the head of an Amazon Echo, without the body (speaker). 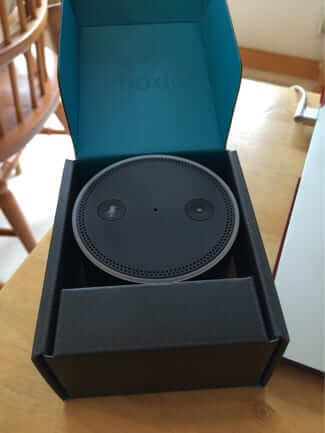 You see, again, the difference between the Amazon Echo Tap and the Echo Dot (besides about $40 difference, with the Echo Dot being the less expensive), is that the Echo Dot has no full speaker (but it does have a small local speaker, so it actually works just like a full-sized Echo only with smaller sound), and is corded, while the Echo Tap is essentially a wireless Echo speaker (it claims up to 9 hours of battery life) with Alexa on board, but you have to tap it (hence the name) to get Alexa’s attention (the original Echo and the Dot are both voice activated). 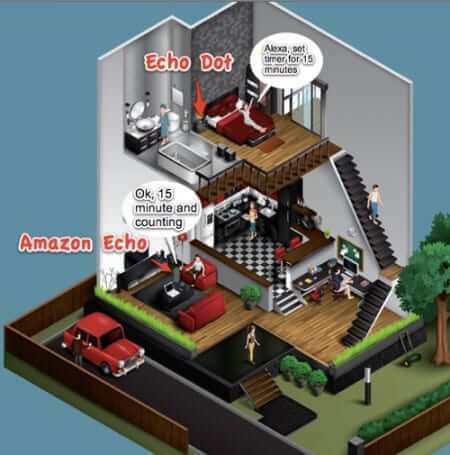 We’re not going to spend a whole lot of time talking about the general setup for the Echo Dot, because it’s essentially identical to the setup for the original Amazon Echo, which you can read about here. 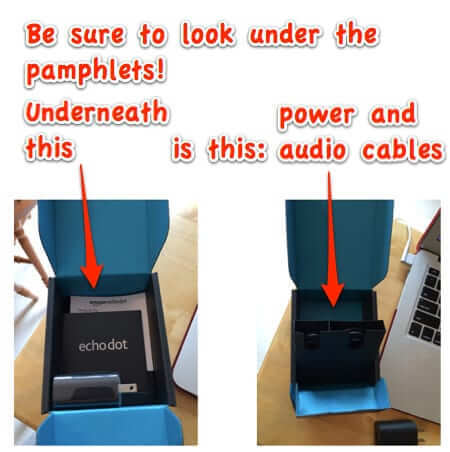 But we do have one caution for you: be sure to look at the very bottom of Dot’s box, because that is where your power cable, and audio cable, are. 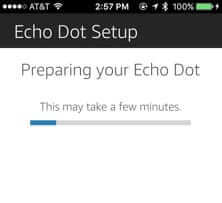 As you will remember from setting up your original Echo, when you are in the Alexa app on your phone or tablet, setting up your Echo or Echo Dot or Echo Tap, there is a step in the process where you disconnect your phone or tablet from your home wifi network, and connect to the Echo / Echo Dot / Echo Tap as your wireless router. 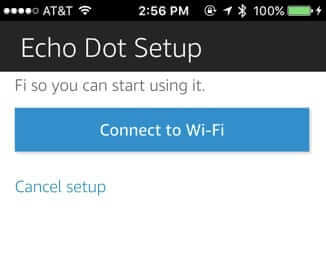 Of course, before you can do that, you have to connect your Echo Dot to your wireless network, so that your phone or tablet can find the Dot (insert obligatory ‘connect the Dots’ joke here). 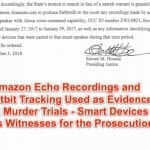 As you are connecting your Echo Dot to your wireless network, you may run into an issue where it just seems to hang when connecting to your wifi network for the first time, or it may even throw you back to the first ‘Connect to Wi-Fi’ screen, even though you were pretty sure that’s what you were just doing. As it happens, after much gnashing of teeth and trying just about everything else, in frustration we rebooted our phone, and whaddaya know, it was all magically set up. 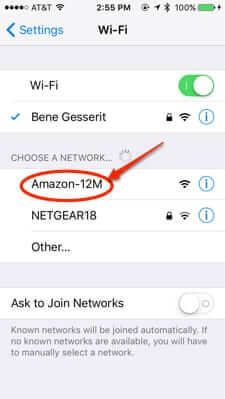 Once your Echo Dot is connected to your own wifi network, you can go on to the next step of disconnecting your phone or tablet from your network, and connecting it to the Echo Dot. 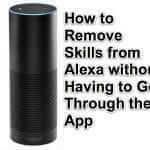 And once you do that, your Dot will show up in the settings in your Alexa app (and your phone or tablet will go back to being connected to your home network). Now is when the fun begins. You can connect your Echo Dot via the included audio cable to any device or speaker that has an audio input. BUT! As you may already know, you can use your Amazon Echo as a bluetooth speaker, such as to stream music from your phone to it. 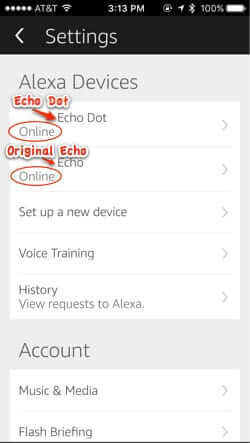 And yes, that does mean that you can also connect your Echo Dot to your original Amazon Echo, using the Amazon Echo as a bluetooth speaker for the Echo Dot, effectively turning your Echo Dot into an extension for your Echo! Where is your Echo right now? If you’re like a lot of people, it’s in a central room in your house. There are any number of ways this can be very useful, from checking the weather in the morning from your bedroom so you know how to dress, to setting the kids’ television watching timer while you’re in the kitchen making dinner, to listening to the news from another room. The possibilities are endless, and it all depends on where you put your Dot. From what room do you most often yell at your Amazon Echo, then have to come out of the room and yell at it again for it to ‘hear’ you? That’s the room in which to plug in your Echo Dot. 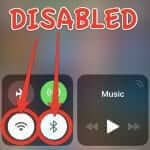 So you don’t have to scroll up to find it, here’s the link again to the instructions for how to connect and use your Amazon Echo as a bluetooth speaker. The difference between the Amazon Echo Dot and the Echo Tap is that the Tap is a wireless, portable Echo, while the Dot is an Echo without a big speaker. 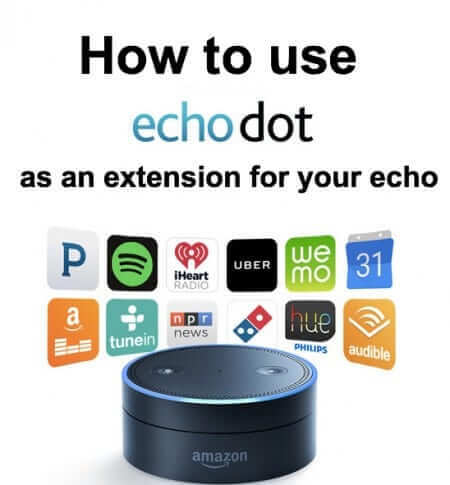 But you can also use the Echo Dot as an extension for your Echo! How do I set up Echo dot to give me messages. I have an echo dot. It wil not work in the large bedroom. I have tried two extenders without success. How about a recommendation as what to do? Have searched the echo site. I don’t have a smart phone or tablet, but I have wi-fi. Will the echo dot work for me? Why does my echo dot keep flashing green? What is the action button used for on Echo Dot? This is CRAP. WHERE do I find a DOWNLOAD so I can use this piece of —-????? ?